Need a little low carb inspiration for your next meal? I’ve got your back with 46 keto side dish recipes for every occasion! This post may contain affiliate links at no extra cost to you. Please visit my disclosure page here for more information. Whether you’re planning a BBQ for two or Christmas dinner for fifteen, these are the keto side dish recipes you need in your life! Save these fabulous low carb sides so you can- as my husband says-make dinner a REAL meal tonight! Hungry? Me too! Let’s get started! The best keto creamed spinach recipe! Find out how to make this epic low carb side with fresh or frozen spinach, cream cheese, butter, and garlic topped with a layer of Parmesan cheese & pork rinds! Get the recipe here! If you’ve never tried fritters this recipe from Low Carb Maven is where to start! These easy low carb broccoli fritters are a great side dish or snack! Tender slices of zucchini topped with a creamy, garlic & cheese topping that is divine! With only 5 ingredients and a 5 minute prep time this one from Joy Filled Eats is perfect for busy weeknights! Ok! Now it’s time to get real. Are these 46 keto side dish recipes enough to end your struggle with the side? Do you need more keto recipes that will make your life and your diet easier? Well, I have exactly what you need! I use these recipes every week. They help save time, money, and sanity! Up to 5 Net Carbs Per Meal: Caloric & macros are calculated for you making it easy to track your meals. Only 5 Steps Per Recipe: Say bye too complicated recipes & hello to helpful tips & easy steps! Accessible from Any Device: Mac, Windows, Android, iPhone. Forgot your grocery list? Pull up the recipe on your phone! 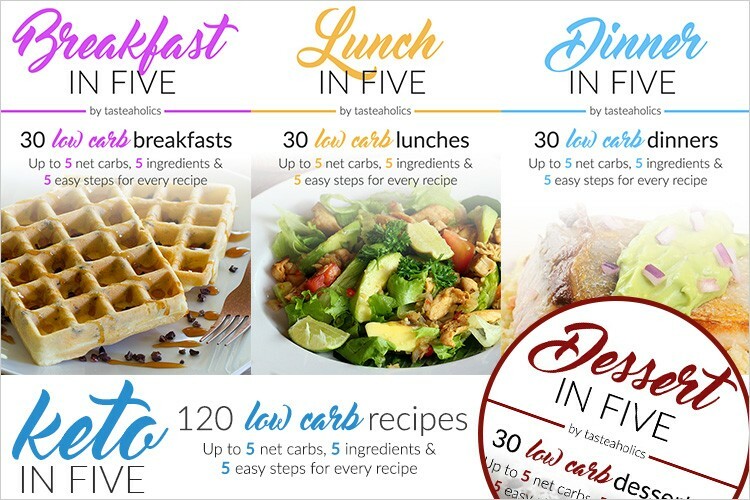 Keto in Five is 42% Off! For a limited time you can buy Keto in Five for $34.97! (Reg. Price is $59.96.) Take advantage of this offer before the holidays! It will help you so much! Seriously, I usually don’t recommend products but this e-cookbook is a game changer! Alrighty! Do you have a favorite keto side dish I missed, or you’d like to share? Link it up in the comments! For more low carb & keto food inspiration, follow my Keto Recipes Board! Don’t Miss These Fabulous Recipes! 16 Easy Keto Breakfast Recipes! Perfect for Meal Prep & Busy Mornings! So many tasty looking ideas here; thanks for including some of my recipes!